The Vancouver Condo Buzz » From $259,900! South Surrey ELGIN HOUSE at Harvard Gardens Condos by Polygon > 1 & 2 Bedroom Floor Plans Available! 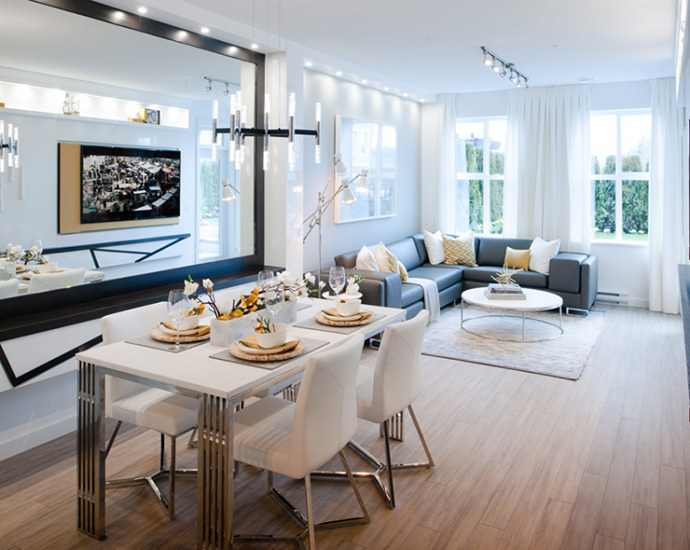 Located in the master planned and highly sought after South Surrey community of Harvard Gardens by Polygon Homes, the new Surrey Elgin House apartment residences features contemporary East Coast architecture, fine finishes and a great location. The project site is at the intersection of 32nd Avenue and 152nd Street Surrey and the newest collection of Harvard Gardens Surrey Elgin House condos will showcase large one and two bedroom apartments for sale this October 2014. From rich architectural character to contemporary finishes, the South Surrey Elgin House at Harvard Gardens condos is a must-see for today’s homebuyers. The location is impeccable as it places you front and centre in the South Surrey real estate district where you are just a stone throw away from such things as top ranked schools and universities, mass transit routes, the SkyTrain, golf courses and recreational facilities. 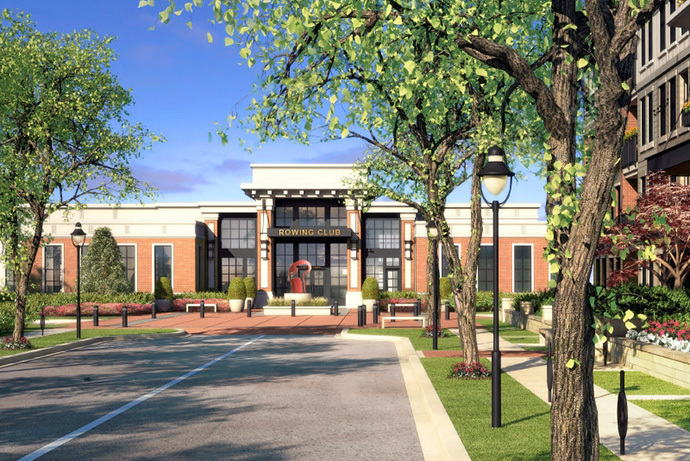 Also nearby are tonnes of shopping, both big box and boutiques, in addition to the community’s own private clubhouse called The Rowing Club at Harvard Gardens. Here, you will find a movie screening room, fitness gym, gymnasium, outdoor swimming pool and spa. The Rowing Club offers over 9,000 square feet of indoor and outdoor resort style amenities. Other on-site amenity spaces includes a Great Room with billiards table, lounge with fireplace, screening room with built in surround sound, two fully furnished guest suites, resident concierge, dog wash station, table tennis, crafts room and much more. The East Coast contemporary architecture is very unique and will feature details like stone and brick cladding, natural wood and vinyl soffits with black metal detailing. The community will feature a lush central courtyard space with trellised seating area and bocci court. There is a striking entrance lobby with wood panelled walls, marble flooring and featured lighting. For more information about the South Surrey Elgin House Condos at Harvard Gardens, please visit the Polygon Homes website at www.polyhomes.com today for additional presales details. The homes are beautifully finished with stained wood panelled doors, rich and durable laminate wood flooring in the living, kitchen, dining and entry as well as 35 ounce nylon carpeting with comfortable underlay for the bedrooms. As well, there are 2 custom colour schemes for you to choose from and over height 9 foot ceilings in most principal rooms as per floor plan. The Elgin House at Harvard Gardens Surrey condos will also feature low E windows, vertical blinds covering sliding doors and horizontal blinds for all other windows in addition to ground floor patios or upper level sun decks/balconies for outdoor living. The beautiful bathrooms include ensuites with designer selected imported porcelain tiled floors and gleaming cabinetry in high gloss white or high gloss gray with modern chrome hardware. As well, there are master ensuites with designer selected engineered stone counters, dual porcelain under mounted sinks in most plans and 2nd bathrooms (wherever applicable) with engineered stone counters and either walk in shower with glass door or a tub. Some designer touches at the South Surrey Elgin House condos includes contemporary patterned hand set ceramic tiled tub and shower surround featuring glass or marble mosaic accents as well as high efficiency dual flush toilets. All homes come with in-suite laundry with front loading washer and dryer, high speed internet connections and closet shelving. The beautiful kitchens feature a premium appliance package that includes an 18 cubic foot Samsung fridge with bottom mount freezer, Whirlpool slide in gas range with self cleaning oven, Energy Star rated dishwasher by Whirlpool and a Whirlpool microwave and hood fan combo unit. These are in coordinated stainless steel finish. The kitchens will also feature engineered stone counters with islands or breakfast bars to accommodate casual dining as per floor plan in addition to soaring, flat paneled cabinets with sleek polished pulls. The drawers and cabinet doors all have soft close hardware. 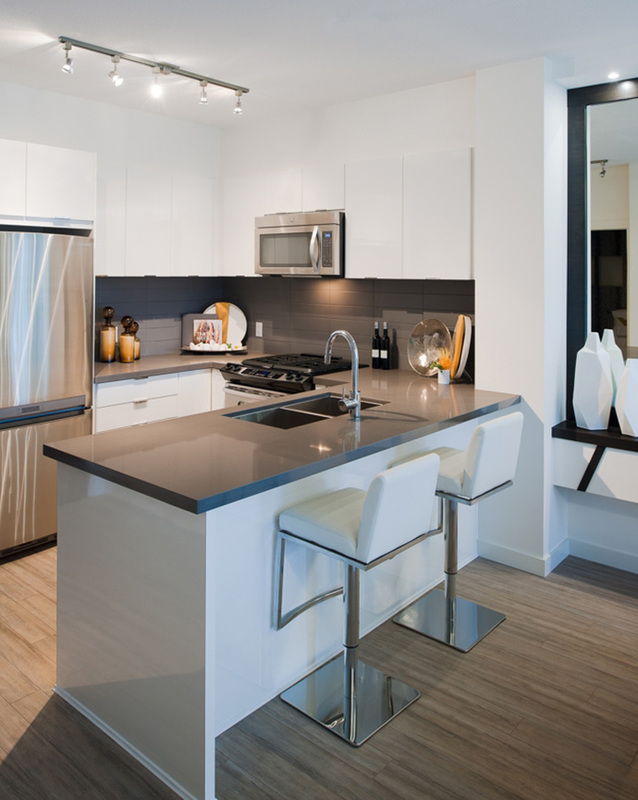 As well, the Polygon Elgin House South Surrey condos will feature quality stainless steel fixtures with under mount sink with Grohe single lever chrome faucet in addition to dual roll out waste and recycling bins and smart cabinetry solutions. All homes are hard wired with smoke detectors and carbon monoxide monitors. All front doors have heavy deadbolt locks and door viewers. Ground level homes have wireless security systems pre-installed and these are also available as an optional upgrade for upper level homes. From their email desk: As a VIP registrant for Elgin House Surrey condos, Polygon’s newest collection of apartment residences at the master-planned community of Harvard Gardens in South Surrey, the homes will be priced from just $259,900! Elgin House at Harvard Gardens Surrey will feature stylish East Coast architecture with brick façades, black wrought iron details and timeless flat rooflines. Inside, the homes are sure to impress with bright open layouts and contemporary finishes including engineered stone counters, warm laminate flooring and sleek stainless steel appliances including gas range. Residents at the Polygon Surrey Elgin House condos also enjoy a privileged location just steps from the future Rowing Club , Harvard Gardens’ private five-star clubhouse designed to offer resort-style living with an outdoor pool and spa, fitness studio, gymnasium, great room lounge, guest suites, resident concierge and much more. 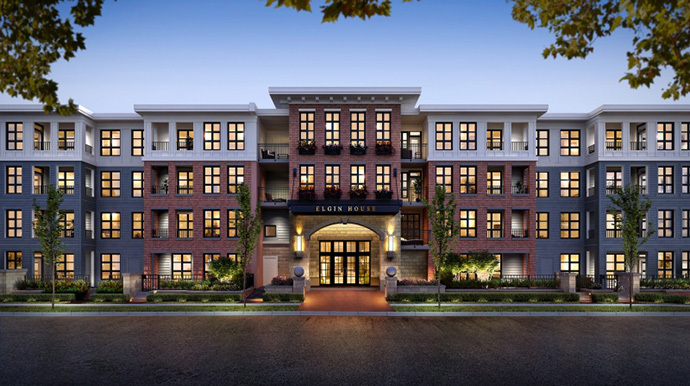 Pre-selling this Fall, Elgin House Surrey Harvard Gardens will feature rich architecture with striking red brick, flat roofs and black wrought iron details. Contemporary interiors showcase well-designed open plan layouts and gourmet kitchens with stone counters, stainless steel appliances and warm laminate flooring. Close to top schools, golf courses, restaurants, transit, shopping and more, residents at Elgin House will also enjoy membership to the private community clubhouse next door – The Rowing Club – featuring an outdoor pool and spa, gymnasium, fitness facilities, screening room and more.